(1850-1903) Born in Peacham, VT in 1850. Rix moved with his family to San Francisco in 1853. In 1868, he was apprenticed to a trading firm and later worked in a paint store painting signs and decorative work. He was briefly a pupil of Virgil Williams at the School of Design but remained self-taught. Rix became close friends with Amedee Joullin and Jules Tavernier, and when the latter established an art colony in Monterey in 1876, Rix was one of the “Bohemians” who followed him there. His studio in Monterey was in the French Hotel, but in 1879 he returned to San Francisco and shared a studio with Tavernier at 729 Montgomery Street. While in new York in 1888 his illustrations appeared in Picturesque California. 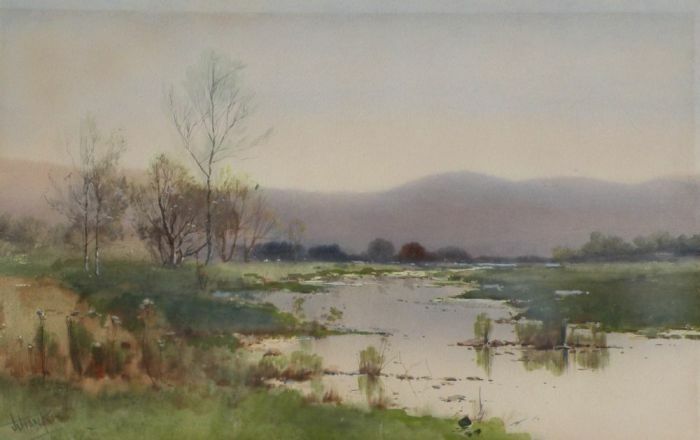 His work was exhibited at the National Academy of Design during the 1880s and, after studying art briefly in Europe during 1889, his watercolors and oils were in great demand in the East. He maintained an active interest and participation in the San Francisco art scene and in 1883 sent back 200 paintings for a successful solo show. Rix returned for several months in 1901 and painted the valleys and mountains near Monterey and Santa Barbara. A handsome man with a New England accent and blond sideburns, he never married and was called the Adonis of the profession. Following a kidney operation, Rix died in New York City in 1903. Member: Bohemian Club; Salmagundi Club; San Francisco Art Association. Works held: Museum; Metropolitan Museum; Bohemian Club; de Young Museum; Crocker Museum; California Historical Society.